For decades, airborne astronomy and geophysical observations have proven useful adjuncts to groundbased and spacebased instrumentation, particularly for optical and infrared studies (e.g., Larson 1994). Compared to groundbased instruments, airborne research platforms offer superior atmospheric transmission, the mobility to reach remote and often-times otherwise unreachable locations over the Earth, and virtually-guaranteed good weather for observing the sky. Compared to spacebased instruments, airborne platforms typically offer substantial cost advantages. With Southwest Research Institute (SwRI) and NASA seed funding, we have developed the hardware and techniques for routinely conducting valuable astronomical and aeronomical observations from high-performance, two-seater military-type aircraft. A key advantage of these platforms over more conventional, larger airborne platforms (e.g., those based around KC-135/Boeing 707s and Boeing-747s) is a significant cost savings, often of order 10:1 per flight hour. Other key advantages include worldwide basing (obviating the need for expensive, campaign-style movement of specialized large aircraft and their logistics support teams), and ultimately faster reaction times to transient events. The SWUIS-A imager we have developed and flight tested in 14 airborne missions since 1997 (http://www.boulder.swri.edu/swuis/swuis.instr.html) consists of an image-intensified CCD camera with broad band response from the near-UV to the near IR, high-quality foreoptics, a miniaturized video recorder, an aircraft-to-camera power and telemetry interface with associated camera controls (called the PIB), and associated cables, filters, and other minor equipment. Video is output to the recorder in RS-170, super-VHS format; in-flight voice log commentary and GPS-derived time-code is also output to the data tape. 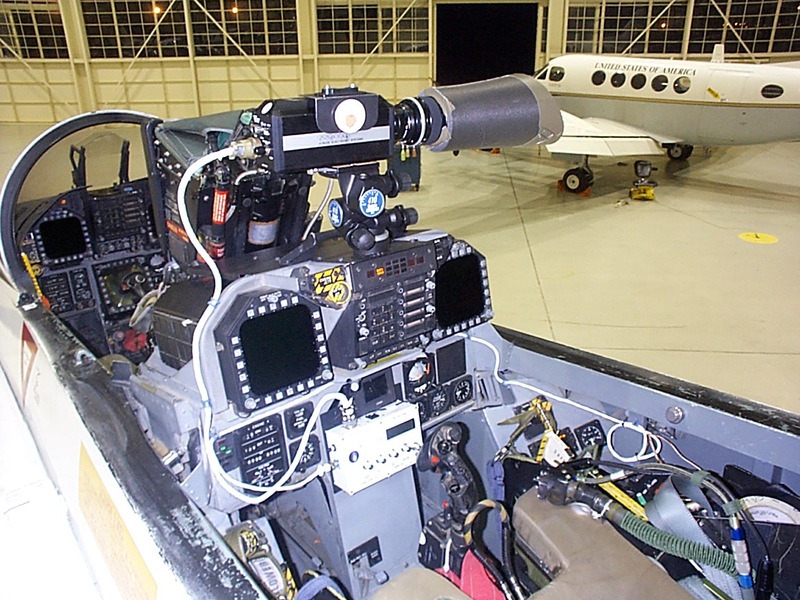 Along with pointing and instrument field of view selection, CCD intensifier gain, video gain, and other controls are available to the instrument scientist in the aircraft. Wavelength bandpass resolution is achieved through the use of interference filters. Recently, a real-time GPS position receiver/data recording capability has also been added. A quick-look data reduction software pipeline has also been created and validated over the past 16 months. SWUIS-A's suite of selectable foreoptics give it high-quality, variable focal length/variable field of view (FOV) capabilities. Available FOVs range from 50 to 2.1 deg. The SWUIS-A ICCD frames at 60 Hz interleaved video rates, which is a key requirement for both jitter compensation and high time resolution (which is useful for occultation, lightning, and auroral studies). Broadband SWUIS-A image coadds can exceed a limiting magnitude of V=10.5/IFOV in <1 sec with dark sky conditions. SWUIS-A is a more compact, airborne version of the NASA-funded SWUIS telescope/imaging system that we developed as a mid-deck experiment to conduct astronomical observations aboard the Space Shuttle (e.g., Stern et al. 1999; Slater et al. 1999). 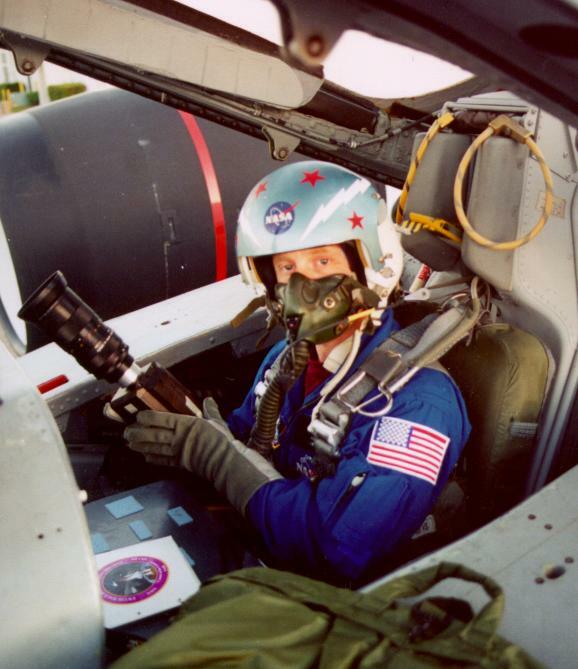 A valuable attribute of SWUIS-A airborne observations is the fact that the astronomer flies with the instrument, thereby providing Space Shuttle-like "payload specialist" capability to "close-the-loop" in real-time on the research done on each aircraft research mission. Flight training for the two SWUIS-A payload specialists (PI Stern, and more recently, CoI Durda), funded largely with SwRI internal research grants totaling over $70K, has included intensive FAA and NASA flight physicals, various aircraft systems training courses, altitude chamber training, aircraft egress and ejection seat training, water survival school, and aircraft certification check rides. We have also created and validated a detailed, 17-page instrument operations checklist (see http://www.boulder.swri.edu/swuis/swuis.instr.html), and have streamlined the process of astronomical and flight planning necessary to bring a SWUIS-A mission to a successful conclusion. As noted above, 14 successful SWUIS-A missions have been flown to date; in every case SWUIS-A performed flawlessly. 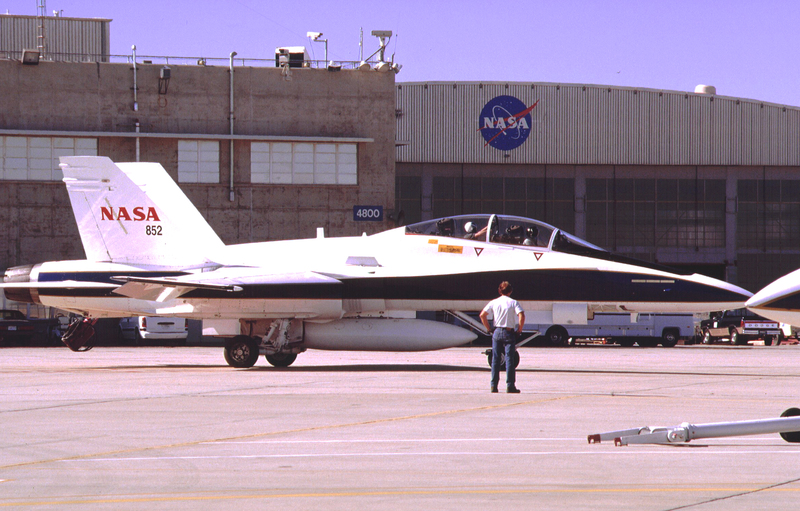 These missions included five high-altitude flights in a NASA WB-57 to observe comet Hale-Bopp in mid-1997, a single mission in November 1998 aboard the USAF FISTA aircraft to study the Leonid meteor shower that year, and eight missions in NASA F-18 aircraft to perfect techniques for observing asteroid and planetary occultations over oceans where groundbased facilities cannot be based. Plans are in development to transition SWUIS-A to F-15/16 and U-2 aircraft as well, in part for their unique technical capabilities, and in part to broaden the available flight opportunities for research. With initial systems development and operational trials behind us, we are now entering what we expect will be a vigorous operational research phase. Additional observations of asteroid occultations are planned, including events involving 45 Eugenia, which was recently discovered to have a small orbiting satellite (Merline et al. 1999). Future SWUIS-A airborne missions aboard high-altitude aircraft, such as two-seater U-2s, will take advantage of the ability of the instrument to look near (and soon, even at) the Sun to search for Vulcanoids (a putative population of small asteroids circling the Sun inside Mercury's orbit) and to observe breakup mechanics in Sun-grazing comets. On the horizon we see the possibility of using SWUIS-A to detect and track space debris that might pose a hazard to satellites, the Space Shuttle, and the International Space Station, and the application of SWUIS-A to the study of a wide variety of terrestrial aeronomical phenomena, including lightning and sprites, aurora, and ozone studies, and future studies of meteoroid showers, missile tests, and other phenomena of interest. We encourage interested users of SWUIS-A, including researchers, operational remote sensing users, and the education/public outreach community to contact the authors to discuss possible collaborative projects. Few institutions can now match the capabilities that have been developed for SWUIS-A airborne, scientist-in-the-loop research missions using comparatively inexpensive, high-performance aircraft. For more information on the SWUIS-A system, or for proposals to fly SWUIS-A, contact the authors at SwRI in Boulder, CO, or visit the SWUIS web site at http://www.boulder.swri.edu/swuis/. Larson, H.P. The NASA Airborne Astronomy Program. In Proc.~Airborne Astronomy Symposium on the Galactic Ecosystem: From Gas to Stars to Dust. (eds., M.R. Haas, J.A. Davidson, & E.F.Erickson). ASP Confr. Series, V73, p591, 1995. Merline, W.J., L.M. Close, C. Dumas, C.R. Chapman, F. Roddier, F. Menard, D.C. Slater, G. Duvert, C. Shelton, & T. Morgan. Discovery of a moon orbiting the asteroid 45 Eugenia. Nature, 401, 565, 1999. Slater, D.C., S.A. Stern, W.M. Tomlinson, D.E. Mahoney, J.Wm. Parker, P.M. Tamblyn, W.B. Colwell, D.D. Durda, P.R. Weissman, & F. Vilas. SWUIS - A compact astronomical UV/VIS/IR imaging system for manned space-based platforms including the Space Shuttle and the International Space Station. Proc. Space Technology and Applications International Forum, STAIF-99, Albuquerque, NM, 1999. Stern, S.A., W.C. Colwell, M.C. Festou, P.M. Tamblyn, J.Wm. Parker, P.R. Weissman, & L.J. Paxton. Hale-Bopp (C/1995 O1) Near 2.3 AU Post-Perihelion: SWUIS Measurements of the H2O and Dust Production. The Astronomical Journal, 118, 1120, 1999. Back to the SWUIS-A web page.